(Austin, Texas - Tuesday, January 2, 2013) - Ralph "Bubba" E. Arnold Jr., age 62, of Floresville, Texas passed away on December 31, 2012. He was born on June 1, 1950 in San Antonio, Texas to Ralph Emil Arnold Sr. and Elsie Landrum. 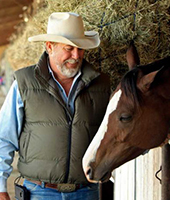 The Texas Horsemen's Partnership Boards of Directors and staff offer their heartfelt condolences to his family in this difficult time. Ralph was preceded in death by his parents. He is survived by his wife, Kathy Stephens-Arnold of Floresville; children, Weylan Arnold and wife Randa of Converse, Tashlyn Smith and husband Gary of San Antonio, Jana Wallace and husband Charles of New Braunfels, Tymonee Piel and husband Jeffrey of Canyon Lake, Tyson Stephens and wife Lindsey of Adkins; grandchildren: Christopher, Kendall, Grady, Ty, Chase, Tristan, Taylor, Rylan, Kasen; great grandchild, Maddoxx; sister, Rayna Sue Arnold; brother, Bodie Arnold and wife Scheri; nieces, Ryssa, Scheli, Amie; nephew, Codie; and many loving friends. Visitation will be held from 5:00 p.m. to 8:00 p.m. on Friday, January 4, 2013 at Finch Funeral Chapel- LaVernia. The funeral service will be held on Saturday, January 5, 2013 at 10:00 a.m. at the Finch Funeral Chapel-LaVernia in LaVernia, Texas. Pastor Dewey Smith to officiate. Interment will follow at the Sutherland Springs Cemetery in Sutherland Springs, Texas. Memorial contributions may be made to Retama Park Chaplain P.O. Box 47535 San Antonio, Texas 78265. You may go to finchfuneralchapels.com to light a candle, leave condolences or memories or stories.